Accounting for yourself even if you’re not an accountant? It’s possible! From sending invoices to declaring your taxes. With InformerOnline every entrepreneur is able to establish his own administration in an easy, quick and safe way! Establishing an online administration is easy and quick for all entrepreneurs with InformerOnline. It doesn’t matter what type of entrepreneur you are. Maybe a starter, freelancer or SME? But the smart software of Informer would suite accountants and foundations perfectly as well! Even though it seems difficult, doing your own accounts is easy for freelancers. Send your tax declaration to the authorities and pay through online banking. Save time and start using Informer! Shaping your finances in an efficient and smart way could be of huge help as a starter. Informer will (partly) take over one of your many responsibilities at the very start of running a business! Collaboration is very usual in the daily business of an SME. Often most tasks are separated. Therefore Informer allows you and your colleagues to work on the administration together! You are perfectly able to do your own accounts as an entrepreneur. Follow a few steps with useful tools to make the most of your accounting software. Still not certain? Your accountant is able to log in from distance to give you advice and guidance. Sending your sales invoices to customers through email is something which saves you time. After some hard work this would be your reward. Impress all of your customers with stunning invoices in your corporate design! You can send invoices through the PEPPOL network, which is completely safe. Besides a PDF file, the invoice will be made into a UBL file as well. A UBL file can be recognized automatically by present-day accounting software like InformerOnline. Furthermore, Invoices could be paid through PayPal or iDEAL. And what if an invoice is overdue? Sending a reminder and summon is easy! That’s what we call smart accounting! In addition to sales invoices you would have to deal with expenses as well as an entrepreneur. These purchase invoices or receipts will be sent to your administration immediately. Redirect invoices to your unique email-address and take a picture of your receipts with the Informer App. Thus, you won’t ever lose any important documents anymore! Processing purchase invoices and receipts could be done in two ways. You could do it yourself by picking a cost category per expense. However, you could also choose to let your expenses be processed by robots. InformerOnline allows its users to utilize several functions concerning robotic accounting. For example the “Scan&Herken” (Scan&Recognize) function. This tool fully recognizes all your invoices. Digital accounting saves you loads of time! After your invoices have been processed, all payments should be registered in your administration. All transactions could be imported from your bank. But you could also use one of our automatic banking links. Every transaction will be put into a clear timeline using these links. Thanks to the Informer “BankRobot”, your invoices will be matched with transactions. And when you fill out information manually? The software will remember this and therefore learn from your actions! Of course it is just as easy to process cash payments in your administration as well. Trusted Cloud protects all your important data in InformerOnline! Speed up the payment process and let your customers pay your invoices through PayPal! Send and receive invoices through the PEPPOL network, guaranteeing safety of your data! Online accounting has a lot of benefits relative to ‘traditional’ accounting with an offline accounting software. More and more entrepreneurs are starting to see the advantages of accounting in the cloud and switch. Not convinced yet? Let us convince you with 5 benefits which you can read below! There is no need to invest in big computers nor servers which would be able to handle the system’s requirements. You don’t have to make any back-ups. InformerOnline does this automatically! Outsourcing is not necessary anymore. Robots will assist you! Archives are fiddling. Everything is saved in the cloud! An online accounting software is built up totally different than a traditional accounting software. Terms such as debit and credit have disappeared mostly. And instead of General Ledger Accounts we speak of Categories. All purchase invoices and receipts should be linked with a category. All complicated accounting tasks will be done automatically in the background. Without you noticing anything. Hence, more and more entrepreneurs are able to do their own accounts! Another point online accounting has won on traditional solutions. All your data is saved in the cloud. This means the cloud-safety should be optimal. Cloud-safety is something in which a lot of money has been invested in the past years. Furthermore, quality marks such as ZekerOnline and Trusted Cloud have been introduced. These quality marks were developed in cooperation with tax authorities and therefore; are completely safe. The InformerOnline software is being tested on all the strict norms of these quality marks each year. As safety has gotten so important for online accounting software we may assume it has beat the offline solutions in safety by now. Online accounting is focused on the future. This counts for all online software, which makes it easier for different programs to link and communicate with each other. And because of these smart links you will save loads of time. You could connect InformerOnline with some other programs as well, ensuring that all data from one program is imported in the other program. Regarding the development of technology, a lot of steps have been made in keeping your administration up-to-date. 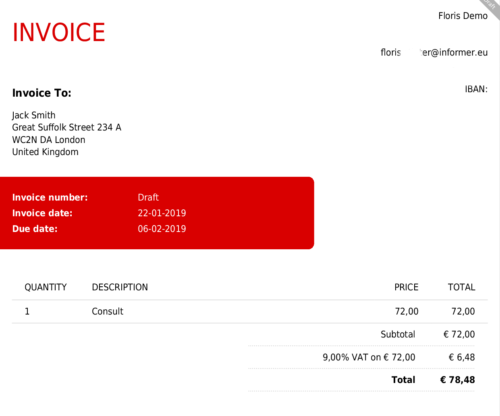 Invoices can now be processed automatically thanks to robots. This has made copying invoice information manually history. Robotic accounting would be the collective noun for tool such as the robots. Thanks to the robots and initiatives like UBL and PEPPOL entrepreneurs save loads of time.